Fall Into First: Be a Reading Detective! 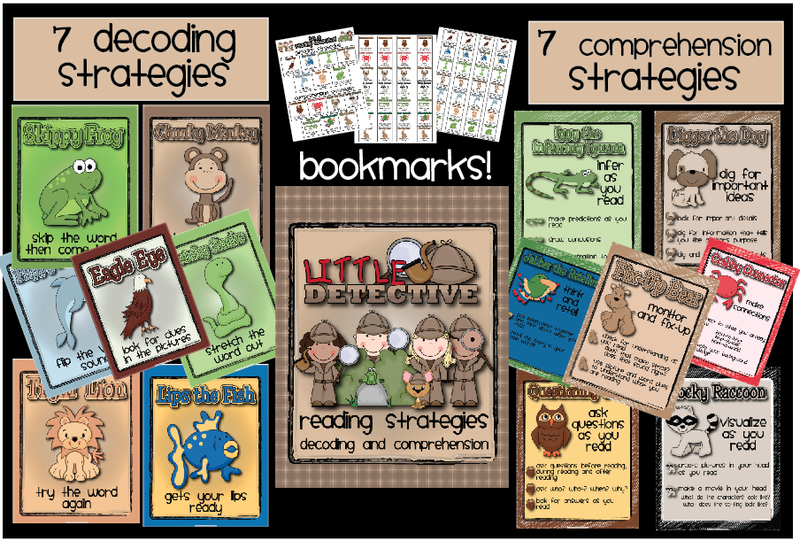 I just posted this fun Little Detectives Reading Strategies poster pack to TpT and Teachers Notebook! 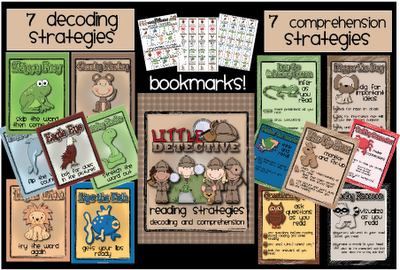 This packet includes the 7 decoding and 7 comprehension strategies I teach my first graders. They really relate to these characters and reference them ALL the time when reading. These have become one of my favorite tools for students! I have also created the matching bookmarks. I give students a bookmark to take home and one bookmark to keep in their book box for use during Readers Workshop. We use these bookmarks during our daily guided reading lesson and I have these posters hanging right behind our guided reading table. My teammate had a genius idea and has taped these bookmarks to her guided reading table! ALSO I wanted to share our fun Tree Maps we did today for "Nouns I Love". We have been working on what a noun is and so I created this fun little tree map so students could write 5 people they love, 5 places they love, and 5 things they love. After completing their tree map students used a tracer to create a heart shape and then divided their heart into sections to write all of their nouns in. This was a perfect Friday activity because like I have said before, my kiddos are paint deprived! You could seriously hear a pin drop while they were painting this afternoon! IT WAS AWESOME!!!! The kids art turned out great! I learned so much about my students through this activity. I posted a couple pics. Sorry I had to blur out the name in the middle. You can download the Nouns I LOVE treemap here!